I have been quite busy, so sorry for the delay. I was planning to add the sea shells to my apple snail tank, as well as my freshwater community tank. I think I am just confused about water chemistry. I have read endless articles , but still something just hasn't clicked yet for me. I still struggle with my apple snails and their eroding shells, despite adding cuttlebone, crushed coral and egg shell powder. This has been unresolved for about 2 months now with no improvement. The reason I wanted to add the shells to my community tank is because I believed it would help add buffering capacity. 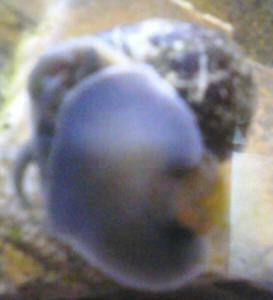 My kH values remain low in that tank and although higher in my snail tank, the values are still low for snails. At this point I believe I'm a helpless cause, but I sincerely appreciate the help attained from your site. Thank you. I had previously avoided the salt mix because I was worried the salt components would harm the snails. My snails are having another issue at the moment (being addressed in a separate thread), so once that is settled I will try the salt mix. I also have a liquid calcium chloride additive intended for marine aquariums that I've been saving as a last resort. So assuming all else fails, would this be safe to use in freshwater and will it have a dramatic impact on pH? Would it make sense to add baking soda in combination with the calcium chloride. The pH in the snail tank is currently at 7.8 and kH is 5. I've considered an alkaline buffering product, but I would exceed acceptable pH values before achieving desirable kH values. Hi Neale. So I started with a 50% dose(baking soda only) and then increased it to 100%. I've been adding the calcium chloride as well. I'm much closer to reaching the optimum relevant values in this tank (thank you so much). My only issue at this point is that I'm confused about how I can continue to maintain the results. Should I continue to add the proper dosage of baking soda/calcium chloride to each batch of new water with every water change? I'm guessing this is a quick fix that I need to keep up with, but I just want to double check. <Correct. One approach might be this: make up the correct ratio of baking soda and calcium chloride. I don't know what amount you're using, but let's imagine it's 1 tablespoon of Epsom salt to 1 teaspoon of calcium chloride. these shells or should I execute the plan all together? <I would not use them at all in this case. You can buy shells that are safe for aquaria, and among the best are the cleaned shells sold in up market food stores alongside tins of French garlic-snails. These shells are spotlessly clean because they're used for cooking food. The garlic-snails ("escargot") are delicious if a bit weird in concept, so there's no waste! I've spent hours reading your FAQ sections and have gained an immense amount of knowledge in the short six weeks since I started raising fish. Your site is the first and the definitive site I go to when I need to know what to do. Six weeks ago I started out as a neophyte on the wrong foot and have been playing catch-up ever since. I had a 2.5 liter jar that lost its lid so I bought 2 female platy and a mat of plastic grass for substrate for the jar. Then I started reading. I quickly realized my jar was a death trap so I bought a 25 liter tank (Aquatlantis 40, 40x20x35 cm) equipped with a Techatlantis TC-200 filter. I know, I know. Too small as well, but it's all I have room for. The filter has a sponge and a charcoal cartridge in it. 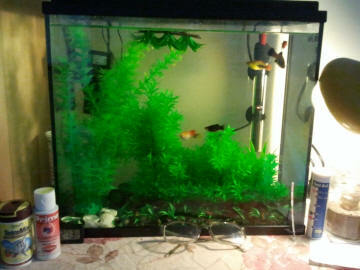 I transferred the two female platy to this tank and within a couple of days one of them died. I bought a male and a female platy (total of three fish now) to keep the surviving female company and the male attacked her viciously, ramming her like a torpedo. I bought another male and two more female platy (six all together now) and they all got along very nicely, although the surviving female remained at the bottom of the pecking order, and finally, last week, succumbed to the stress of her harassment (she showed the "pine-cone" look toward the end). So now there are 5 fish (2 male, 3 female) and they are frolicking and frisky and look comfortable for the most part. I must say though that the newer male has looked unwell and then miraculously well again several times per day. Since I did not know about cycling until after I had the fish I tried to make up for my mistake by changing the water every day during the breaking-in period by. I removed 1.5 to 2 liters each day. I use local tap water treated with Seachem Prime (a 4 liter bucket of tap water with 10 drops sits for 24 hours before I use it). I vacuumed the substrate twice a week. The substrate is a plastic grass mat held down by lots of glass marbles my kids outgrew. I've added a long low plastic "bush" and a tall plastic "feather fern" to give these fish plenty to explore. I feed them TetraMin food flakes once a day; only as much as they can eat in 5 minutes. I have a 25 watt heater that warms the water over a range from 25C to 28C. Unfortunately, its thermostat is not sensitive enough to narrow the range. I shine a table lamp in through the side of the tank. Its bulb is fluorescent so it doesn't add any measurable heat to the system. KH is between 10-15 d; GH is between 8-16 d. Despite the double-dose of Seachem Prime the test strips indicate a trace of chlorine, which may or may not be due to the lack of sensitivity of the strips. Now for my question: I was pleased when I saw the first indication of nitrite about 10 days ago. This meant my cycle was progressing as it should. But the nitrite keeps climbing! I know from what I've read that nitrite is toxic at any level, but it has reached a reading of 5-10 mg/l and held rather than spiked! I have gotten conflicting advice from several sources, but I trust you guys the most. I just bought a small bag of ceramic bio-beads to put in my filter. I removed the charcoal cartridge and suspended it in the water beside the filter, so there is no flow through it, but its there. Now the tank water is flowing through the bio-beads instead. Was this the right thing to do? There is no air-pump in my 25 liter tank because the filter stirs the water surface nicely and my fish don't visit the surface. I've been told to only change the water twice a week to give the bacteria more time to multiply, so now twice a week I change 4 liters at a time. I've been watching the nitrates on my tester stick; they are close to 100 mg/l! At least that reading comes down perceptibly with each water change, but not drastically. To add to the confusion, these platy "seem" so content with their home that they are adding cute little fry to the mix and the fry are doing nicely too. They've been adding a little extra nutrition to their parents' diet. Since they appeared I've put off vacuuming my substrate. If I hadn't done so much reading I wouldn't be able to tell from watching the fish intently (they are so nice to watch) that there is something wrong. Is there anything wrong with what I've done so far that I should correct, or should I just be patient and wait for the tank's system to run its course and finish cycling itself eventually? Thanks for any advice and/or encouragement you can give me. 1) I'll stop feeding for now, as you advise, but how will I know when to start feeding again? week). Does that strategy work or do you recommend a different regimen? Fish are doing much better now in my tank but my nitrite is getting higher everyday. It's now 3.0, stress level. Why is this?? My ph is fine and everything else seems fine. A lot of my plants have died too. Is there anything I can do to drop the nitrite levels? One of my tanks is doing its usual once-in-a-while nitrite spike. It's a 115 ltr / 29 gallon well-planted tank, ammonia is 0ppm, nitrates are about 10ppm (currently housing 4 guppies, 4 tetras, 5 juvenile split-tailed rainbow fish, 2 cherry shrimp and 2 dwarf Gourami). I cleaned the filter out in tank water as normal but did add the five new juvenile fish. It was fine for a week and now I am seeing (as I frequently do about once every month or so) a little nitrite spike (about 0.3ppm if left). I am currently doing about 3 x 50% water changes per day to keep the nitrite reading about 0.1ppm or below. Am I being obsessive here? I've lost fish before from nitrites so I am keen to make sure they are safe as I can possibly get them with water changes. I know ANY ammonia or nitrite is dangerous but is 0.3ppm acceptable for a day or two or should I continue with the mammoth buckets of water changing every few hours? Many thanks from an exhausted, but well exercised fish keeper! Many thanks as always. The nitrite blip stayed steady at 0.1ppm all day yesterday so I gathered the nitrifying bacteria had doubled up enough within 24 hours. I did another 30% water change last night and the tank subsequently read zero nitrites and again this morning so it appears I am out of the danger zone at the moment. All fish appear fine. The monthly blips could actually be the washing of the media in the tank water at the same time as an increase in fish population according to the pattern in my records - it makes sense. Therefore, Bob's suggestion of increasing filtration/media seems a sensible approach to try. I have ordered some ceramic media/bio rings. My current filter doesn't hold very much, about 6 media rings (and I believe here lies the problem for the 115 ltr / 29 gallon tank). Can I simply put the bio rings in a bag at the back of the tank or do they need a flow of water (say from a filter) to make them work efficiently enough? I'm trying to avoid a costly replacement or additional filter if possible, but if you think this is the only way to rectify the insufficient media surface, then I shall try that route instead. As ever, many many thanks. I spoke too soon, or rather, I shouldn't have fed them this morning. Nitrites about 0.1ppm again. I had been churning up the brown matter on top of the sand/substrata when water changing which may also have disturbed the nitrifying bacteria. I guess a few more water changes and a bit more patience. I'll investigate some alternative filter devices too. I have a two month old 30 gallon tank, well planted and fully cycled holding 4 Platies (1M/3F), 4 guppies (1M/3F), 8 neon tetras and a few cherry shrimps in London - and I know, the tetras are not great with London water. I have a little nursery net in it holding about 50 x 1 week old guppy fry. Everything has been fine until yesterday when I washed the filter in tank water and did a 25% water change when I noticed the nitrites were around 0.8ppm (ammonia at 0 and nitrates at 25). The only other thing I did was to remove the carbon and fine media from the filter (I had medicated with eSHa 2000 a few days before hand due to one of the dry developing what looked like a fungal infection). I've added aquarium salt (accordingly as your article suggests also aware that the tetra will not like this) but today the nitrites are still around 0.8ppm. I'm now not sure how to reduce the nitrite levels further. Can't see any dead things in the tank and have cleaned the sand/plants/gravel too. Should I just leave the tank alone? I do have another empty cycled tank (10g) that I could pop some in if it will help. Many thanks for your assistance as always!